Interrupts! You use them to detect the change in pin status, timers, communication and so on. I’m sure if you reached this post in need of using interrupts (or having trouble with interrupts), then I assume you know what interrupts are and what you are trying to use. With XC8, using interrupts is programmatically simple, since most of the code layout is given to you by <xc.h>. Now setting up interrupts is as simple as using the keyword “interrupt” before the function which should be called when an interrupt happens. I am not going to cover the difference between C18 and XC8 (XC8 makes your life a lot easier), but I’ll show you how to use interrupts in XC8. This post will have only the input from pin change. The timer interrupt will be covered later in the timer chapter. 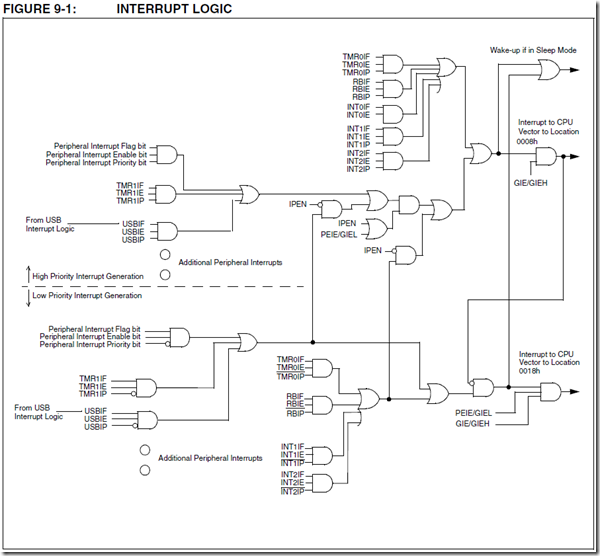 I encourage you to read the datasheet in order to understand much better about interrupt registers. Make sure the IO pin you are going to use for interrupt actually has interrupt feature. Because I have seen people using some random pin out of nowhere and say interrupt is not working. Usually PORTB has most of its pins with interrupt capability. As you know I have been using PIC18F4550 here and according to the datasheet (screenshot below), RB0 is INT0. So now I will be connecting a switch pulled up to VCC. When the switch is pressed, the pin voltage becomes zero. So I will be setting the interrupt to work at the falling edge. 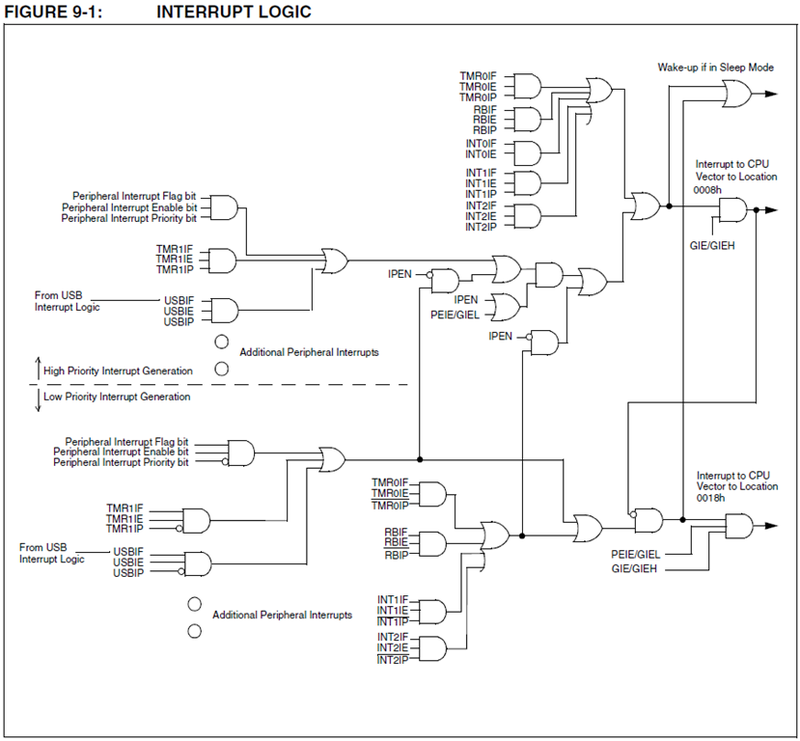 When an interrupt happens, you need a subroutine (fancy word for function) to do something. Note: Read the datasheet for proper way of setting the high and low priorities. No matter how how many code snippets are out there, without reading and understanding the datasheet, there is now way you can get outputs as expected. Compare the code snippet and the logic diagram. Will make a lot of sense and you should be able to take from there. Hello my friend, I use the pic18f26k80 too but I get not use interrupt function. Can you help me? Your tutorials on Timers, interrupts for XC8 are invaluable. I wonder if your going to do something on capture ie pulse counting and period measurements. There is lots on PWM but very little on CCP with !8F series. Some stuff on C18 but little on XC8. Do you have anything helpful at the moment. Things I have written here are code that I have to write for something else. I haven’t come across a need for CCP yet. But if you find any C18 code for CCP, you should be able to use them for XC8 with little or no change. All the best. hi, i am starting pic18f26k80 with xc8 compiler for hcsr04 ultrasonic sensor…. there’s a typo when you say to put RB0 as output, it’s input. Thanks for this tuto that goes strait to essential. Don’t have a clue who’s problem you are talking about. If you are looking for #pragma for interrupt code, you don’t need that in XC8 compiler. If you are using C18, then you need the keyword pragma to tell it is an interrupt function. This is a XC8 tutorial. Hi I am a PIC beginner. Please let know how to use Interrupt when the timer is overflow in MPLAB.x using XC* compiler. Please also let me know how to use the timer four the same ISR or the Interrupt service routine. INTx, INTxE, and INTxF bits are used when the PIC has several interrupt sources from more than one pin changes (p.e. x = 0,1,2 in PIC18F4550). When a MCU device only has one source of interrupt on pin change (p.e. like in the old PIC16F877A and other mid range 16F MCUs) you only use INT, INTE and INTF. because interrupt flags are set by hardware events even when they are not enabled by their own interrupt enable bits. also, it throws error at the _asm line. I read the xc8 manual and your tutorial and declared as told by you. Now it compiles ok.
if that is the case, in the new xc8, will the compiler see to this problem, or should we do it like the one above? The compiler will take care of it. I started studying about XC8 compiler according to your guidelines. When I reached the interrupt section I was having a doubt. INT0E and INT0F is not listed in the intellisense menu of INTCONbits. Instead it is having options like GIE, INTE, INTF,PEIE, RBIE, RBIF, T0IE,T0IF, TMR0 and TMR1. Even if the code is compiling successfully it is very difficult to use. I there any solution to solve this problem? I am using MPLABX 2.05 and XC8 1.30. Don’t rely too much in intellisense. Read the datasheet and follow it. so my theory seem to be true. There are only 2 interrupt vectors high and low priority. What cause the interrupt should be checked in interrupt routine. no dedicated vector for each interrupt. Its name should be more general for any interrupt and move CheckButtonPressed into the comment. Thanks for the comments. Making a change in the post after its published is a pain since the formatting goes everywhere. But i’m sure some people go through the comments and you have summarized it excellently! I’m not testing your code yet but I just curious. How the compiler know that you intend to call CheckButtonPressed function for the the interrupt? I don’t see you specify it anywhere. One theory that I made up is every interrupt call that routine. so at least compiler should allow more than 1 interrupt routine. Also you named the routine very specific in my opinion not just any interrupt should call the routine. You see the “interrupt” keyword when I define the function? That “interrupt” keyword tells the compiler that any interrupt happens anywhere, call me (the function CheckButtonPressed). There are 2 types of interrupt. High and low which is the other keyword being used when defining an ISR function. 8bit controllers do only nested interrupts. Which means when interrupt happens, you need to have an “if” condition to look at which peripheral created the interrupt. In case of 16bit and above they are addressed individually with upto 8 priority levels (compared to high and low in 8bit case). Hope I explained what you asked for? Another confusing thing according to the interrupt picture INT0 is always high priority. Your code handle it like a low priority. Btw many thanks for these high quality tutorials. They help a lot to me. Keep up the good work. In this case RB4 is an output, and RB0 is an input.